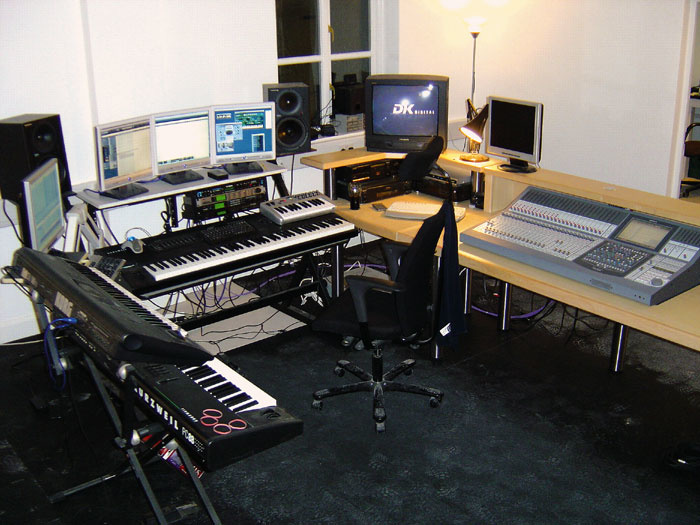 SOS reader Raj Dhamu's studio, as pictured in June 2001's Readerzone article. I am writing in connection with the Studio SOS feature on monitoring and acoustic treatement which appeared in the February 2006 issue (www.soundonsound.com/sos/feb06/articles/studiosos.htm). 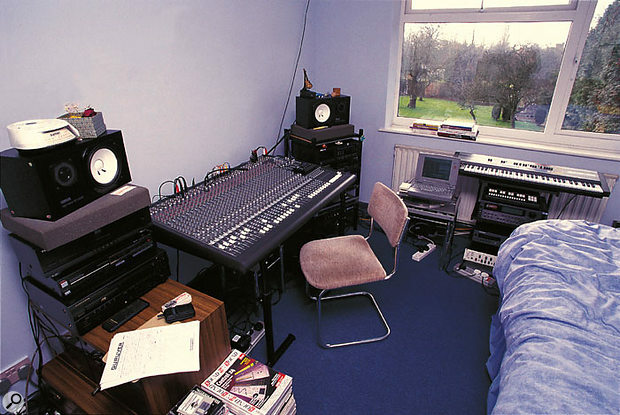 The main photo you have used is of my bedroom studio, from the Readerzone article you did with me in June 2001 (www.soundonsound.com/sos/jun01/articles/readerzone0601.htm). You have used it to point out errors in monitoring setups, but as it's my setup, it points the finger at me and I want to put you right about a few things! Paul White mentions my speakers being on their side as a mistake; I'm afraid he is wrong. If you look at the photo carefully, you will see my monitors are Yamaha NS10M Studio monitors which are designed for horizontal placement, generally on-console, but horizontal nevertheless. They are not designed for vertical placement like most monitors, so my placement is correct. As to the monitors being asymmetrical, as I mentioned in the original Readerzone interview, I use my studio for tracking and arranging, not for mixing and mastering, which is completed at a pro studio. As I have the gear in the bedroom, when it is in use, the bed is moved to make more space and the gear as you see it in the picture is moved away from the wall to a position that delivers a better sound, with the monitors placed at the right equilateral shape for my listening position. Reviews Editor Mike Senior replies: I'm sorry if you felt we had a go at you in that caption. That was certainly not our intention. We chose to use that picture to illustrate some of the points Paul White was making generally about monitor placement in his particular article, and not to single you out for criticism. You are, of course, right that the manual for the NS10M Studio monitors clearly states that they are 'basically designed for horizontal placement'. However, the rationale behind this statement is a little unclear given that the manual then goes on to say that 'they may be placed vertically with no effect on reproduction quality'! The fact of the matter is that positioning the drivers in any two-way speaker horizontally is going to narrow the width of the monitoring sweet spot compared to a situation where the drivers are arranged vertically. A lot of professional studios had been using the previous NS10s on their sides before the NS10Ms came out, mainly to avoid interfering with engineer's line of sight when the speakers were placed on the console's meterbridge. I think that Yamaha's orientation of the NS10M was more a response to this common practice than because it provided a better sound. Admittedly, if you're monitoring in the nearfield, the impact of the narrower sweet spot shouldn't be very dramatic, but I'd probably still recommend putting the speakers vertically rather than horizontally, in spite of Yamaha's panel legending, especially if you're working alongside anyone else in the same room. I was searching the Net for information on reel-to-reel tape and came across your Q&A on the subject published in your July 2004 issue (www.soundonsound.com/sos/jul04/articles/qa0704-3.htm). In it, you state: 'a half-track machine won't be able to play quarter-track tapes, and vice versa, unless it is fitted with additional heads to accommodate the alternative format'. This is only half true. A half-track machine can't play quarter-track tapes (well, it can, but they sound really strange, which might actually be a desired effect! ), but a quarter-track machine can play half-track tapes. The trick when playing a half-track tape on a quarter-track machine is to turn off or otherwise disable the channel that plays backwards, perhaps using the balance control on the amplifier. I used to do this all the time when playing mono tapes on domestic stereo machines. The mono tapes were recorded with one mono channel in each direction. When played on stereo machines, one stereo channel would contain the desired mono signal, while the other stereo channel would contain the other mono signal played backwards (the 'Paul is dead' phenomenon). The unwanted signal could be eliminated by setting the amp to play only the left (or right) channel. This must actually have been taking place before the amplifier stage because it also affected the Tape Out connections and could be used to copy a mono tape to a stereo medium if desired. Another simple solution is to feed the output of only one channel from the stereo machine into both input channels of an amplifier via a Y-adaptor. Another application of this principle allowed me to record four separate programs on one reel-to-reel tape — two in each direction — as long as they were all monaural. My stereo tape deck (a Tandberg 3000X) allowed for recording to or playing back from just one channel on a stereo tape. Thus, I would record one program on each of the two channels (left and right) in each direction. Regarding your review of the Korg Legacy Collection Digital Edition in the February 2006 issue, it was an excellent review. For your information, the Legacy Wavestation software will not work in Cakewalk Sonar 5 'out of the box'. In fact, Sonar 5 will crash when you try to insert Wavestation as a VST, and Wavestation also has a problem with Sony Acid Pro 5. But there is a free update on the Korg support site (www.korguser.net) which fixes all these problems and adds all the sounds from the Korg T1 to Legacy M1. So the Digital Edition is now even better value than when it was reviewed! I look forward to the Sound On Sound review of Native Instruments' Bandstand. It should be a very interesting MIDI GM player. The TTS1 virtual synth module in Sonar 5 has a 49.5MB folder of instrument samples; Bandstand ought to be significantly better with 2.5GB of samples. News Editor David Greeves replies: Thanks for taking the time to get in touch, John. Just to clarify things for all our readers, the Korg Legacy Collection Digital Edition version 1.1 update is available as a download for registered users from www.korguser.net and it includes Wavestation v1.5.3 (which incorporates those bug fixes) and M1 v1.5 (which features those Korg T1 sounds). We'll be reviewing Native Instruments' Bandstand very soon. Its large sample library should certainly provide a fantastic range of sounds, but it's important to remember that while size does undoubtedly matter, it really is what you do with it that counts! It's interesting to note that at a time when sample libraries and sample-based instruments are expanding to sizes that border on the impractical, Korg still felt that there was sufficient interest in the aforementioned M1, with its paltry 4MB of sample ROM, to create a virtual version. In Hilgrove Kenrick's article on 'Making a Living From Music For Picture' in the February 2006 issue of Sound On Sound, there is a picture of his personal workstation. It shows his main writing station complete with MIDI controller, three computer monitors, Mackie HR824 monitors and some rackmount gear. I was wondering what furniture he is using for his setup. I've been in the market recently for a 'proper' setup and have become quite well read on offerings from Quiklok, Omnirax, Argosy, and Raxxess. Hilgrove's desk looks like a Quiklok, but I notice that he has a full-sized upper shelf for his computer monitors to sit upon. I couldn't find this add-on on Quiklok's web site. Also, I'd like to know if the desk is height-adjustable? My biggest gripe is getting the piano keys at the proper playing height while retaining a somewhat ergonomic placement for the computer keyboard and mouse. Hilgrove Kenrick's studio formerly featured a mix of custom-built furniture and off-the-shelf Quiklok stands. SOS contributor Hilgrove Kenrick replies: You're quite right — it's a Quiklok Z555 stand with plenty of rack add-ons and an extra crossbar. Quiklok also offer square plates for placing desktop units or screens on the upper crossbar. What I did was use these plates to support a laminated chipboard shelf on which I could rest the three TFT screens. The main desk surface is height-adjustable with three possible levels, the lowest of which was about right for piano height, though it meant I was eternally bashing my knees on the sliding keyboard shelf underneath! I have now replaced the Quiklok unit with totally new custom furniture to complete my new setup, but of all the various cobbled-together furniture arrangements I went through previously, the one pictured was the most satisfactory. It refused to wobble even during enthusiastic playing, and the monitor plates were more than up to the task of supporting heavy active speakers. Of the other systems you mention, I only have experience of Omnirax and Argosy, both of whom make seriously solid units. Personally I have always favoured a flexible approach — you don't want to shell out hundreds of pounds on furniture that's only designed to take certain shapes and sizes of equipment. Even my new custom furniture is basically a series of flat tabletops at the right heights to take equipment, rather than cut to fit (say) one particular mixer. That way, when I come to change something, I won't be right back at square one. Two weeks ago, my Formac computer monitor developed a problem. By the time I contacted the company, I found that my three-year warranty was out of date by three days, including a weekend! I took the monitor in anyway and hoped for the best. Lo and behold, it was shipped to Germany, repaired and returned to my house within two weeks, and Formac did not charge me anything at all, despite the expired warranty. Formac not only supply an excellent product (two friends bought one after seeing mine), I would also describe their service as beyond the call of duty. I am one happy customer!